The Whimsical Shop will leave you in a 'pink mood' with all their cute and red-eye products like pens, bags, storage boxes, etc. Like the name suggest The Whimsical Shop has quaint, fancy, cute minis and daily essentials. We'll get to the point already! They have everything from chocolate milkshake shaped water bottle, mini sling bags, storage boxes, and mason jars, all their products are the kind of things you'll find on Pinterest. We might not be too keen on using their pens. Well, that's because they are way too cute for wear and tear. 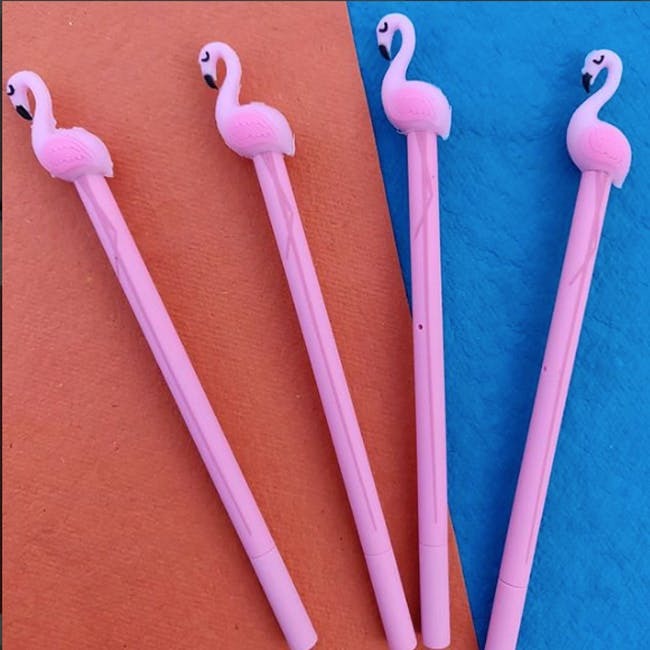 Flamingo and swan-shaped, pens with ice cream covers, carrot and paws pens, oh, we love the way these pens look. We love their donut erasable pen which is charming. Is unicorn your spirit animal? Then you will love their unicorn notebook and pen set. Browse through their bags - and you will find this adorbs sling that comes in the shape of the Instagram logo. Take a pic of the bag for your post! Roll up a hand-written note, place it in the bottle and gift it that special someone. These message bottles start at INR 250. Coming to their bags - they have an uber cool duffle bag for INR 1050 that has pink sequinned on it. Organise all your makeup in their flat lay makeup bag that costs INR 300. They also have tassel wallets which are pretty neat and look good with Indo Western attires. One of their most adorb product is there magical unicorn eye mask, perfect for those red-eye flights. These are priced from INR 300 onwards. Talking about travel, stand out from the crowd with their luggage tags that come in different shapes like strawberry, ice cream, donut, cupcake, airplane, and are priced from INR 150. Ladies, do check out their geometrical hair clips that come in metallic colours and priced from INR 80.